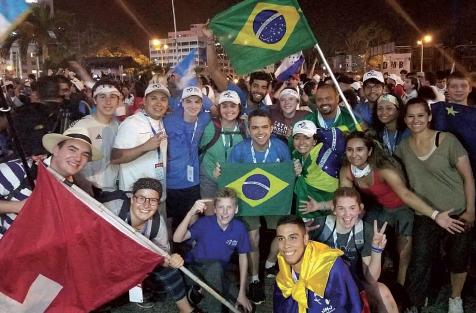 Last January, I was fortunate enough to participate in my first ever pilgrimage to World Youth Day, which this year was held in Panama. This was a beautiful and transformative experience like no other. Hundreds of thousands of people came from all over the world for this one event. Not only was it incredible to meet people with different cultures from so many different countries, it was amazing to see so many people coming together for a common belief that is much bigger than themselves. No matter what language, or what continent, what skin color or age, we all had something in common, and it was God. I have always heard about how religion and the Catholic church have caused distress and separated people in certain parts of its history, but this was a glorious example of how Jesus and Catholicism can really unite us all. There was simply a good atmosphere; for me, it felt like I could really feel all of the Holiness, the love and the prayers of all the people around me going up. It was fascinating to see so many people with such a close relationship with God, one which I aspire to have. The trip was full of reflection and learning about the ways in which God works through us and loves us. But most of all, it was such an honor to be able to see Pope Francis, and so close too! His words were so wise, and I am eternally grateful to be able to have been in his presence. He talked to us, the youth, about how God is calling us. We are the youth of today, not of the future or of the “meanwhile”. He preached to us about how we must have the courage and the love for God that Mary had, because we have what it takes to do something great, to leave a positive imprint, in our lives and in the lives of others. 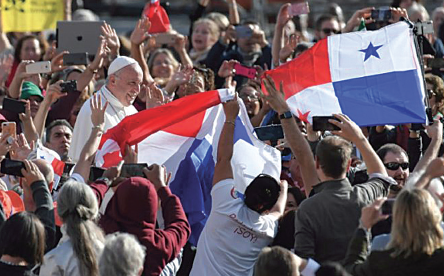 Overall, World Youth Day 2019 in Panama was an enlightening and truly unique experience. I look forward to attending future WYD and growing in my faith.